I recently asked our awesome Facebook family to hit me up with some potty training questions. The response was fantastic! 45 (and counting) questions later, I have my work cut out for me. Perfect! That’s what we are here for. So, without further ado, the first questions, with more answers to come! How do I know when he is ready to go with just a pull-up or underwear during naps, or over night? Potty training during sleep can seem pretty daunting! I know I put it off for as long as possible! However, it may not be as big a transition as might be anticipated. There are a few things you can do. First, minimize liquids before sleep time so your child is more likely to not have to go at all. Next, as soon as they wake up, take them to the potty. As for readiness, you may want to watch for times when he is waking up dry. That’s a good sign he has begun to develop the ability to hold it in his sleep. Don’t be discouraged by some wet accidents during sleep time. Stock up on a few extra sheets and a protector for the mattress and give it a go. My son took over a year to really potty train during the day, yet night trained in a week. Go figure! Omg I can get her to potty?? I had to giggle a bit at this one. Yes. Yes you can! Children don’t enter college not potty trained, so it’s a pretty safe bet to say they learned somewhere along the way. Patience. Consistency. A sense of humor. Extra cleaning products. You’ll get there! My 3 year old son is doing great at home in just his underwear but as soon as we put pants on him he pees in them! So he goes around in just his underwear at home but when we leave the house he needs to be in pull- ups all the time. I swear there is something about little boys and the love of as few clothes as possible! Kind of a random idea, but what if at home you also put a pair of underwear OVER the pants, to give him a visual of what he wants to keep dry? Make it a game, and have a good giggle together while you try. It’s worth a shot, and if anything, you can get some very amusing photographs. Also make sure he is taking responsibility for the wet accidents, from cleaning up the floor (or helping to do so), to putting soiled clothes in the wash, and then washing his own hands. For leaving the house, I suggest maybe trying very short outings. Perhaps as short as a walk down the street and back at first, and then maybe a quick trip to the nearest store, and so on. Tell him if he stays dry on these very short trips, big things are in his future… whatever reward you deem as a good one. What are your best tips? Be sure to visit our TIPS page for a list we’ve generated too! We get lots of good questions on our Facebook page, and from time to time we like to answer them here! This is something all parents start to wonder, often around a child’s second birthday. Can it be true? Is it time to ditch the diapers? I found this blog by a mom who, much to her surprise, is potty training her little guy at just 15 months. What do you think? Good timing? Too early? Just right? 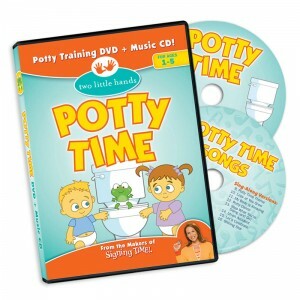 From time to time a blogger will take a look at the Potty Time program and write up a review. We love that Potty Time is spreading and recently saw some great independent insight into what we offer. 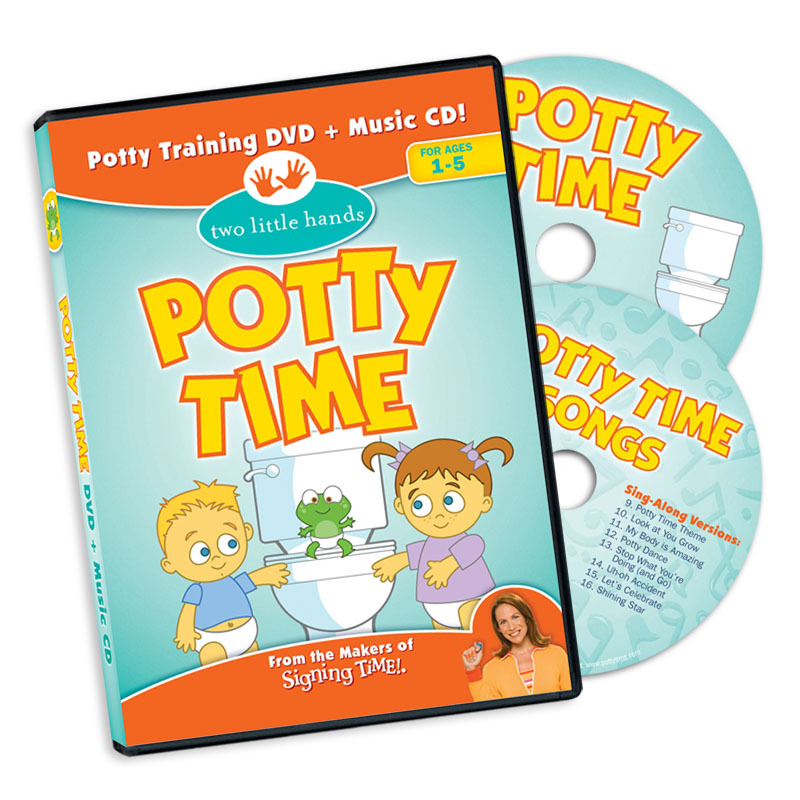 Potty Time is a fantastic combination of sign language, songs, verbal, auditory, and visual stimulus to help a little toddler learn about how amazing their body is. In Potty Time you learn new sign language signs. Each sign is showcased with Rachel (the creator and instructor of the videos) showing the new sign and saying the name of the sign. Also showcased is the actual word written out, plus a photo to show what the word means. It’s a very well rounded instruction to ensure any learning style will be well received. Thanks, Amber! We’re so glad you liked Potty Time! To read lots more about Amber’s take on our programming, and see what else she’s up to, please visit her blog at JadeLouise Designs!